Green Solution Building Services, LLC is the safe, non-toxic, cleaning choice for homeowners, businesses, hospitals, and schools. 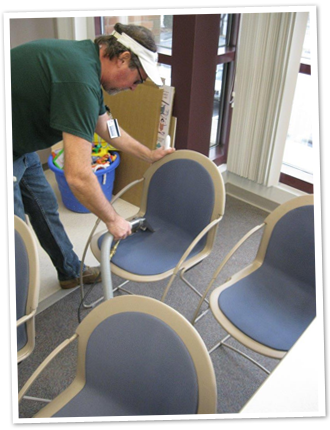 Only the best Organic cleaning solutions are used to provide a deep clean that also protects your health, and the health of your employees and customers. Green Solution has decades of experience cleaning: Office Buildings, Medical Buildings, Manufacturing Facilities, Banks, Insurance Companies, School, and for Defense Contractors. Have you had a problem with finding a cleaning company that actually does what you want them to do? You may want to get all the answers on their performance before you hire them to maintain your facility. a. What services do they offer? b. What training do they have? / Have they taken any specialized courses? 3. What cleaning products do they use? a. Do they know their products? b. What about environmentally friendly products? 4. What equipment will they use? a. Is it new or kept in good condition? b. What equipment will be stored at you facility? 5. Who are their clients? a. How long have they retained those clients? b. Do they have at least 15 references? 6. How do they handle training of their employees? 7. What about safety issues for your facility? a. How do they handle OSHA requirements? 8. What insurance coverage do they have? 9. How do they control their quality? a. Do they have supervision? b. Do they do inspection reports? c. Is there a communication log? 10. What are their charges for daily work? a. What about specialty work (i.e. : Carpet and tile floor maintenance, window cleaning, etc.)? 11. Does the contractor understand your expectations? Not all cleaning companies are the same. You may not have the time to be revisiting this problem every 6 to 12 months. Green Solution Building Services can resolve this problem for the long term.